As a guide and naturalist certified by the Galapagos National Park Service and the owner of the Galapagos Eco Lodge on San Cristobal Island in the Galapagos Islands, one of my great pleasures is taking my hotel guests, cruise ship passengers, tourists and visitors snorkeling with the sea lions. The pleasure I get each time I do this is immeasurable to me and I am sure to my guests as well. As a ubiquitous and playful creature of the Galapagos Islands, the sea lions are sure to bring a smile and joy to everyone who encounters them and has the once-in-a lifetime opportunity to frolic in their natural habitat, the luxurious and pristine Pacific Ocean in which the Galapagos Islands are situated. Though every day in the Galapagos Islands is very special, this was a day I was really looking forward to as I was taking my group to swim with the sea lions near Bartolome Island. Until now, it’s been at closely kept secret – or, at least I thought it was a secret. 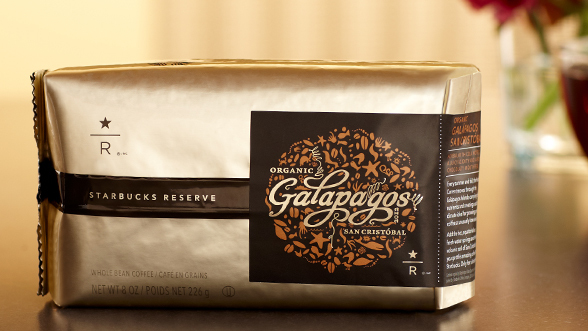 San Cristobal Island grows some of the best coffee beans anywhere in the world. Whether you’re waking up and ready for that first burst of flavor for the day or you’ve had a satisfying meal and want something special with your dessert, our coffee is the answer. And you can visit San Cristobal's historic coffee plantation to see the old growth trees and taste the coffee yourself. This is a very special adventure and shows the diversity of the Galapagos Islands. As I said, I thought it was a secret. Now, I have discovered that Starbucks – the ubiquitous world wide coffee shop – has discovered this treasure too. In 2010 and again in 2012, it offered San Cristobal special blend coffee beans in limited qualities – all of which are gone now.